Gastric cancer is a common and highly lethal malignancy in the world, but its pathogenesis remains elusive. In this study, we focus on the biological functions of CDK-associated Cullin1 (CAC1), a novel gene of the cullin family, in gastric cancer, which may help us to further understand the origin of this malignancy. The AGS and MGC803 gastric cancer cell lines and the GES-1 gastric mucosa cell line were selected for study. At first, CAC1 expressions of those cell lines were examined by quantitative real-time reverse transcription polymerase chain reaction (qRT-PCR) and western blot examinations, then CAC1 small interfering RNA (CAC1-siRNA) were designed and transfected into the AGS cell line with a relatively high level of CAC1. Once CAC1 was silenced, a series of biological characteristics of AGS cells such as cell proliferation, cell cycle, apoptosis, and expressions of apoptosis-related genes (P53, BCL2 and BAX) were determined by MTT, flow cytometry, qRT-PCR and western blot, respectively. CAC1 expression of AGS or MGC803 was much higher than that of GES-1. After CAC1 expression was effectively depressed by RNA interference in AGS cells, significant cell growth inhibition occurred. 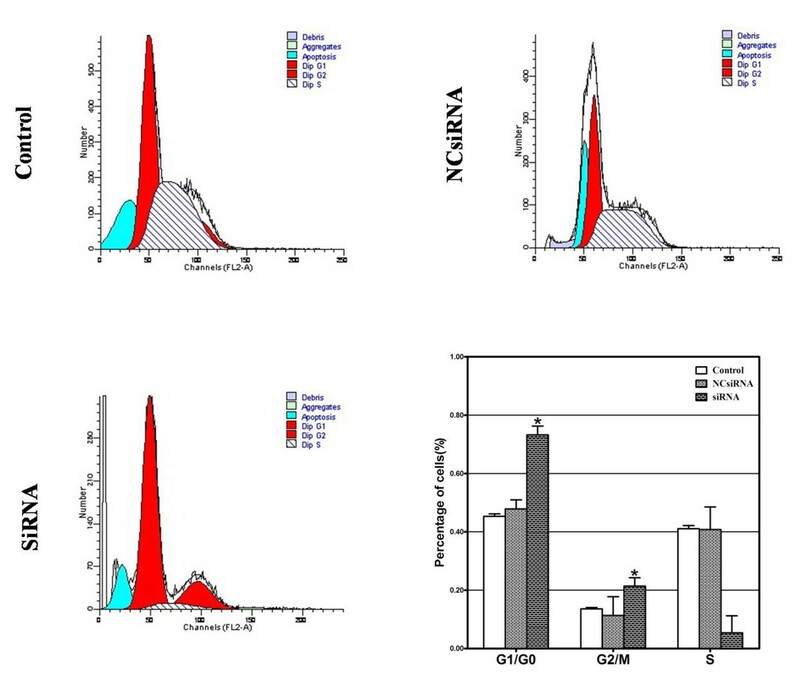 Furthermore, the proportion of cells treated with CAC1-siRNA increased in the G1 phase and decreased in the S phase, indicative of G1 cell cycle arrest. More importantly, the proportions of early/late apoptosis in AGS cells were enhanced with cis-diaminedichloroplatinum (cisplatin, CDDP) treatment, but to a higher extent with cisplatin plus CAC1-siRNA. Interestingly, BCL2 mRNA copies showed about a 30% decrease in the cisplatin group, but dropped by around 60% in the cisplatin plus CAC1-siRNA group. Conversely, the P53 mRNA expressions obtained nearly a two-fold increase in the cisplatin group, in addition to a five-fold increase in the cisplatin plus CAC1-siRNA group, and the BAX mRNA levels had almost a two- and four-fold augmentation, respectively. Meanwhile, P53, BAX and BCL2 showed the same alteration patterns in western blot examinations. CAC1 can promote cell proliferation in the AGS gastric cancer cell line. Moreover, it can prevent AGS cells from experiencing cisplatin-induced apoptosis via modulating expressions of P53, BCL2 and BAX. Gastric cancer is one of the most common malignant tumors and the second leading cause of cancer death in the world, responsible for a total of 989,600 new cases and 738,000 deaths annually . Over past years, there has been a steady decline in the incidence and mortality risk of gastric cancer in most countries , due to the tremendous developments in diagnosis and treatment methods. However, gastric cancer remains a great threat to people, especially those in developing countries , and the survival of all affected patients, even after curative surgical resection and adjuvant therapy, is less than 40% . Epidemiologic investigations have uncovered many risk factors for gastric cancer, and molecular biology research further indicates that gastric carcinogenesis comprises numerous genetic and epigenetic events, involving a cluster of oncogenes, tumor suppressor genes, cell cycle regulators, cell adhesion molecules and DNA repair genes . However, the precise mechanisms underlying gastric cancer are not well defined. CDK-associated Cullin1 is a novel gene identified in colorectal carcinoma. It embraces an open reading frame sequence which encodes a 37 kDa protein of 369 amino acids . The CAC1 protein contains a cullin domain between amino acids 137 and 250, and is therefore classified as a member of the cullin family of E3 ubiquitin ligases . Histological investigations had established a possible association of CAC1 expression with pathological features and clinical stages of colorectal carcinoma patients . Moreover, CAC1, in vitro, was expressed in a cell cycle-dependent manner with high expression in the late G1 to S phase . Notably, CAC1 could promote cell cycle progression and stimulate the kinase activity of CDK2. Nevertheless, little is known about its expression and biological characteristics in gastric cancer. The present study was conducted to investigate the expression of CAC1 and to explore the function that CAC1 performs in gastric carcinoma cell lines. The AGS cell line was selected as the model for study because it expressed relatively high level of CAC1, then CAC1 expression was silenced by RNA interference (RNAi), and a series of biological parameters relevant to cell proliferation, cell cycle and apoptosis were examined, correspondingly. Human gastric cancer cell lines (AGS and MGC803) and gastric mucosa cell line (GES-1) were provided by Central Laboratory of Medical College, Xi’an Jiaotong University, China. Cells were cultured in RPMI 1640 medium (Gibco BRL, Grand Island, NY, USA) supplemented with 10% newborn calf serum (Gibco BRL, Grand Island, NY, USA), 100 kU/L penicillin, 0.1 g/L streptomycin, 0.3 g/L L-glutamine and 0.85 g/L NaHCO3 at 37°C in a humidified atmosphere containing 5% CO2. CAC1-siRNA (sense-GGA UGG UGC CAU AGA UCA ATT 3′, antisense-5′UUG AUC UAU GGC ACC AUC CGG3′), CAC1 negative control siRNA (NC-siRNA, sense-5′UUC UCC GAA CGU GUC ACG UTT 3′, antisense-5′ACG UGA CAC GUU CGG AGA ATT 3′) were chemically synthesized by Shanghai GenePharma Corporation (SGC, Shanghai, China). All siRNAs were mixed into Lipofectamine2000 (Invitrogen, Carlsbad, California, USA) and transfected according to the siRNA Transfection Protocol. The efficiency of CAC1 knockdown was evaluated with qRT-PCR and western blot tests. The MTT (3-[4,5-dimethylthiazol-2-yl]-2,5-diphenyltetrazolium bromide thiazolyl blue indicator dye) chemosensitivity assay was applied to determine the proliferation rate of AGS gastric cells. Cells were seeded at a concentration of 5 × 103 cells per well in 96-well plates. All experiments were conducted in triplicate. Cells were incubated for 24 hours and were divided into five groups with five different treatments (null, NC-siRNA (60 nmol/L(nM)), siRNA (30nM), siRNA (60nM), siRNA (90nM)) for 0, 24, 48, 72 and 96 hours, correspondingly. Twenty microliters of 5 mg/ml MTT (Sigma Chemical Co, St. Louis, MO, USA) in phosphate buffered saline (PBS) were added per well and cells were left inside the incubator for another 4 h at 37°C, followed by the addition of 150 μl DMSO. Absorbance of the colored solution was measured by a fully automated multi-detection microplate reader (POLARstar OPTIMA, BMG Labtechnologies, Offenburg, Germany) at 490 nm. Cells (1 × 105 cells/well) were harvested in 6-well plates for 24 hours, and were treated with different agents (null, NC-siRNA, siRNA (60nM)) for 48 hours. Then they were collected to be washed with 0.01 mol/L cold (4°C) PBS by spinning at 800 rpm, 4°C for 8 minutes, and then fixed in 4°C, 75% ethanol for a night. Fixed cells were centrifuged (as above) and washed again with PBS. Then cells were treated with 100 μl of DNase-free, RNaseA (10 mg/ml) and incubated at 37°C for 10 minutes. Finally, cells were stained with 100 μl of 100 μg/ml propidium iodide (light sensitive) and incubated at room temperature for 30 minutes. Cells from every sample were placed in Falcon tubes and read on a FAC sorter (Becton Dickinson, Franklin Lakes, NJ, USA). The cell cycle profiles were interpreted with B-D FAC Sort Cell Quest software. Cells (1 × 105 cells/well) were incubated in 6-well plates. After 24 hours, they were addressed with different agents (null, cisplatin (10 μM), cisplatin (10 μM) + NC-siRNA (60nM), cisplatin (10 μM) + siRNA (60nM)) in serum-free medium for 24 hours, then collected cells were stained with Annexin V/PI using Vybrant apoptosis assay kit No. 2 (Molecular Probes, Eugene, Oregon, USA) and analyzed by flow cytometry. Total RNA was isolated from various cell lines (AGS, MGC803 and GES-1) using the acid guanidinium-phenol-chloroform method (Trizol, Invitrogen, Carlsbad, USA), and cDNAs were synthesized using the PrimeScriptTM 1st Strand cDNA Synthesis Kit (Invitrogen, Carlsbad, USA). Primer sequences used for amplification were designed by TaKaRa (Takara Bio Inc., Shiga, Japan) and listed as follows: forward primer 5'-GCA GCA TAT TCA GAA AGT TCA GA-3'; reverse primer 5'-CAT TTA CAG CCT AAT GCC TTT ACT-3'. β-Actin forward primer 5'- TGG CAC CCA GCA CAA TGA A -3'; reverse primer 5'- CTA AGT CAT AGT CCG CCT AGA AGC A -3'. Primers were used in regular PCR reactions with cDNA from cells so as to evaluate their proper design and synthesis. Subsequently, the PCR products were sequenced and their similarity to the desired nucleotide sequences confirmed. The relative amount of mRNA was determined using the SYBR GREEN PCR Master Mix (AB, Applied Biosystems, Foster City, California, USA) with gene-specific primers for CAC1 or β-Actin. All steps were carried out according to the manufacturer’s protocol. Real-time PCR reactions were carried out on an ABI 7500 thermal cycler (Applied Biosystems, Foster City, California, USA) with the BioRad iQ5 and MyiQTM Real-time PCR Detection System (BioRad Laboratories, Hercules, California, USA). Three independent PCR tests were performed from each RT sample. The expression of CAC1 mRNA in each sample was normalized against β-actin and the expression level was calculated using the ΔΔCT (delta delta threshold cycle) method. RNA isolation and cDNA synthesis were performed as noted. A series of primers were designed and synthesized by TaKaRa including P53 (forward-5′-CCA CCA TCC ACT ACA ACT ACA T-3′, reverse-5′-AGG ACA GGC ACA AAC ACG-3′), BCL2 (forward-5′-CAA ATG CTG GAC TGA AAA ATT GTA-3′, reverse-5′-TAT TTT CTA AGG ACG GCA TGA TCT-3′), BAX (forward-5′-GAC ACC TGA GCT GAC CTT GG-3′;reverse-5′-AGG AAG TCC AGT GTC CAG C-3′) and β-Actin (forward 5′-TGG CAC CCA GCA CAA TGA A-3′; reverse 5′- CTA AGT CAT AGT CCG CCT AGA AGC A −3′) genes. As indicated above real-time PCR was performed three times. The PCR products were detected by measuring the emitting fluorescence at the end of each reaction cycle. The threshold cycle corresponds to the number of cycles required to detect a fluorescence signal above the baseline. The β-Actin gene served as the internal control of the reaction. The mRNA expression levels were calculated using the 2-ΔΔCT method and expressed in relative quantification units. In detail, the threshold cycles of the housekeeping gene β-Actin and the target genes BCL2, BAX and P53 were determined in each sample and for each time period. CT values were normalized (ΔCT) by subtracting the expression levels of the reference gene β-Actin from the corresponding expression levels of the BCL2, BAX and P53 in each sample. The normalized gene expression in the treated AGS cells was analyzed relative to their matching untreated cells, which acted as calibrator samples (ΔΔCT). Fifty micrograms of total protein from the AGS cell line was separated on a 10% Trisglycine SDS polyacrylamide gel and transferred to a nitrocellulose membrane (BioRad, Hercules, California, USA). The blot was probed with mouse monoclonal antibodies including anti-CAC1 (GeneTex, Irvine, California, USA, 1:1500), anti-β-Actin (Santa Cruz, CA, USA; 1:5000), anti-P53 (Santa Cruz, CA, USA; 1:2000), anti-BCL2 (Santa Cruz, CA, USA; 1:2000), and anti-BAX (Santa Cruz, CA, USA; 1:2000). Antibody binding was detected using the Gel Blot Imaging Systems (Syngene G:BOX, Cambridge, U.K.) according to the manufacturer’s protocol. All statistical analyses were conducted using SPSS 13.0 software (http://www-01.ibm.com/software/analytics/spss/). Each assay was performed at least three times. The data were expressed as mean ± standard deviation, and One-way ANOVA test (two-sided) was performed to determine the significance of differences in multiple comparisons. The results were considered to be statistically significant at P <0.05. CAC1 mRNA expression was evaluated with real-time RT-PCR in three cell lines. Obviously, CAC1 was expressed in each of the examined cell lines (Figure 1A). However, AGS and MGC803 cell lines showed higher levels of CAC1 mRNA than the GES-1 cell line (1.0000 ± 0.0000 and 0.9507 ± 0.0176 versus 0.4340 ± 0.0414, P <0.05). In addition, CAC1 protein expression in western blot examinations showed the same changing trend as CAC1 mRNA (Figure 1A). CAC1 expression in human gastric cancer and mucosal cell lines. (A) Real-time reverse transcription (RT)-PCR and western blot analysis of CAC1 expression in AGS, MGC803 and GES-1 cell lines (*represents P <0.05 between the GES-1 cell line and other cell lines). (B) CAC1 expression was effectively depressed by 60nM CAC1-siRNA in the AGS cell line on the mRNA and protein level (*represents P <0.05 between the control group and the CAC1-siRNA group). Transient transfection of AGS cells with CAC1-siRNA oligos (60nM) designed against CAC1 sequence effectively inhibited the expression of CAC1. CAC1 mRNA expression was examined by real-time RT-PCR. As expected, mRNA level of CAC1 was considerably decreased in CAC1-siRNA group (1.0000 ± 0.0000 versus 0.3583 ± 0.0244, P <0.05), but showed no significant difference between the control and NC-siRNA groups (1.0000 ± 0.0000 versus 0.9597 ± 0.0407, P >0.05) (Figure 1B). Meanwhile, CAC1 protein expression was also depressed after siRNA treatment in western blot examinations (Figure 1B). 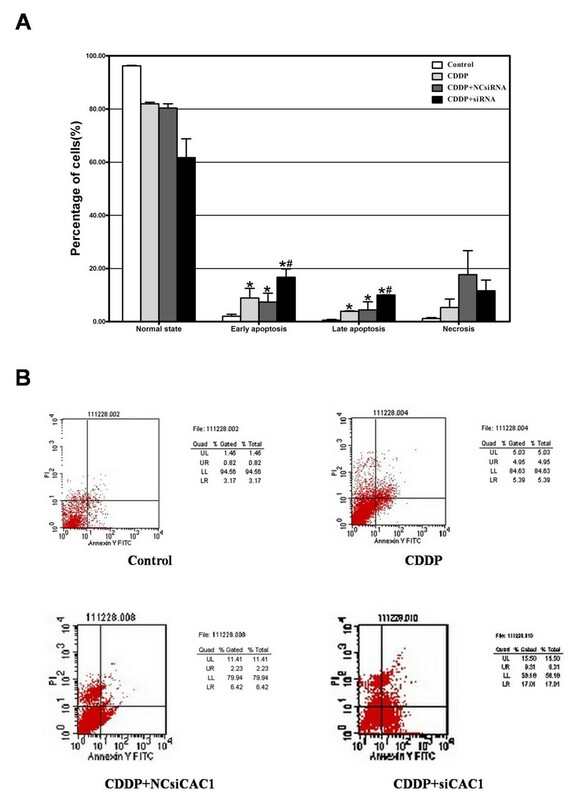 In order to investigate the role CAC1 plays in the regulation of cell proliferation, AGS cells addressed by transient transfection with CAC1-siRNA of three different dosages (30nM, 60nM and 90nM) were subjected to MTT assay. Within four days, CAC1 silencing exhibited a distinct inhibitory effect on cell proliferation according to different doses of CAC1-siRNA (Figure 2). 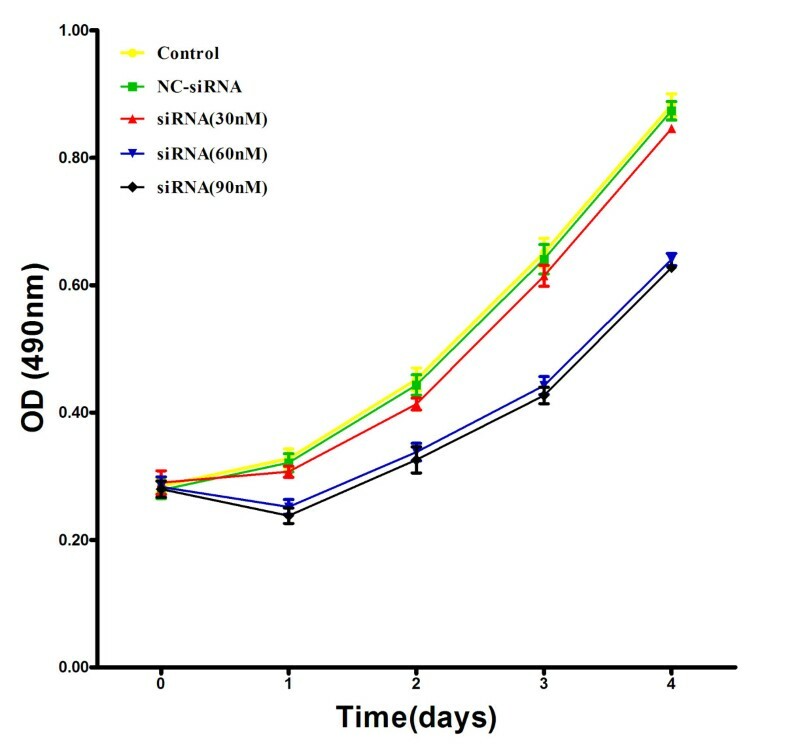 Optical densities (ODs) of the control group, the NC-siRNA group and the 30nM CAC1-siRNA group showed no significant difference with each other (P >0.05), but were higher than those of the 60nM and 90nM CAC1-siRNA groups (P <0.05). Interestingly, cells treated with 60nM and 90nM CAC1-siRNA showed almost identical ODs from the beginning to the end (P >0.05). Cell growth was inhibited following CAC1 silencing. AGS cells were transiently transfected with null, NC-siRNA and three concentrations of CAC1-siRNA for four days, respectively. Growth rates of cells were determined by MTT assays. Compared with the control, the proportion of cells treated with CAC1-siRNA increased by 28% or so in the G1/G0 phase (45.33% ± 0.82% versus 73.23% ± 3.04%, P <0.05), and decreased by approximately 36% in the S phase (41.07% ± 1.07% versus 5.40% ± 5.83%, P <0.05), with no significant change in the G2/M phase (13.61% ± 0.46% versus 21.37% ± 2.88%, P >0.05) (Figure 3). These results indicate that CAC1 may promote cell cycle progression of AGS cells through the G1/S transition. Knockdown of CAC1- induced G1 cell cycle arrest in the AGS cell line. Cell cycle analysis of AGS cells treated with or without CAC1-specific siRNA by flow cytometry. Proportion of cells was markedly elevated in the G1 phase while reduced in the S phase when treated with CAC1-siRNA (*represents P <0.05 between the control group and the CAC1-siRNA group). The AGS cells were divided into four experimental groups: the control group, the cisplatin-treated (10 μM) group, the cisplatin plus NCsiRNA group, and the cisplatin plus CAC1-siRNA (60nM) group. Compared with the control group, the proportions of early/late apoptosis were enhanced with cisplatin treatment, but to a higher extent with cisplatin plus CAC1-siRNA (2.01% ± 0.78% versus 8.87% ± 3.65% versus 16.69% ± 3.15%/0.57% ± 0.25% versus 3.89% ± 0.15% versus 10.01% ± 0.09%, P <0.05) (Figure 4A and 4B), which signified that the knockdown of CAC1 dramatically accelerated cisplatin-induced apoptosis. CAC1 silencing enhanced cisplatin-induced apoptosis in AGS cell line. (A) The effects of cisplatin alone and in combination with NC-siRNA/CAC1-siRNA on early and late apoptosis of AGS cells (*represents P <0.05 between control group and treated groups; #represents P <0.05 between the cisplatin (CDDP) group and other treated groups). (B) Apoptosis patterns of AGS cells were analyzed by flow cytometry. The mRNA levels of CAC1, BCL2, BAX and P53 were examined by qRT-PCR. 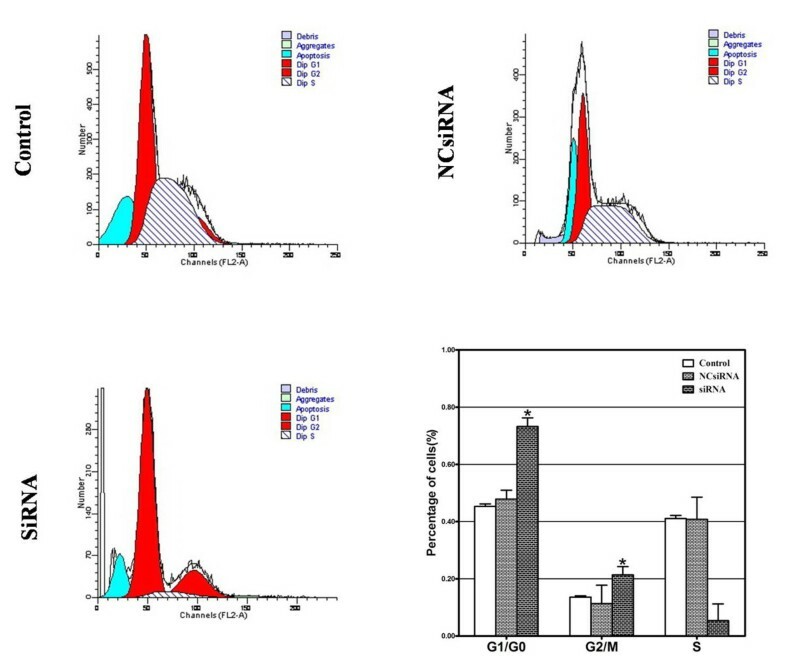 Incubation of the AGS cells with 10 μM cisplatin and/or 60nM CAC1-siRNA for 24 h did produce interesting mRNA profiles (Figure 5A). Under cisplatin treatment, CAC1 mRNA expression greatly increased, but dropped to a low level when CAC1-siRNA was added simultaneously (1.0000 ± 0.0000 versus 2.1578 ± 0.2222 versus 0.3967 ± 0.0078, P <0.05). Compared with the control group, BCL2 mRNA copies showed a 30% decrease in the cisplatin group, but dropped by around 60% in the cisplatin plus CAC1-siRNA group (1.0000 ± 0.0000 versus 0.7090 ± 0.0210 versus 0.4030 ± 0.0171, P <0.05). Conversely, P53 and BAX transcript levels of treated groups were vastly enhanced. Compared with the control group, the P53 expression obtained nearly a two-fold increase in the cisplatin alone group, in addition to a five-fold increase in the cisplatin plus CAC1-siRNA group (1.0000 ± 0.0000 versus 3.0187 ± 0.1738 versus 5.9957 ± 0.3926, P <0.05); the BAX mRNA levels had almost a two- and four-fold augmentation (1.0000 ± 0.0000 versus 3.0237 ± 0.2581 versus 4.9897 ± 0.2923, P <0.05), respectively. Expression profiles of apoptosis-related genes in response to cisplatin alone or with CAC1 -siRNA treatments. (A) Real-time reverse transcription (RT)-PCR analysis of CAC1, P53, BAX and BCL2 mRNA expression in AGS cells (*represents P <0.05 between CAC1-siRNA group and treated groups; #represents P <0.05 between the cisplatin (CDDP) group and other treated groups). (B) Western blotting analysis of CAC1, P53, BCL2 and BAX expression in AGS cells. Then western blot tests were conducted to detect the protein levels of those genes after CAC1 knockdown. In parallel with the aforementioned mRNA changes, BAX and P53 were markedly upregulated whereas BCL2 was downregulated on the protein level (Figure 5B). The ubiquitin-proteasome system plays a pivotal role in maintaining the balance between normal growth and uncontrolled proliferation by controlling the abundance of a large variety of cellular proteins . The cullin family of ubiquitin ligases, traditionally composed of CUL1, 2, 3, 4A, 4B, 5 and 7, represents the largest class of RING-type E3 ligases (CRLs) . Without intrinsic catalytic activity, cullins serve as scaffolds that facilitate the assembly of multimeric E3 ligase complexes and transfer ubiquitin from the E2-conjugating enzyme to the substrate. Cullin-mediated substrate degradation dictates a wide range of cellular processes such as proliferation, differentiation, and apoptosis. Once the cell regulatory mechanisms of cullin encounter malfunctions or perturbations, accumulation of oncoproteins or excessive degradation of tumor suppressors will inevitably occur, which may provoke cells into malignant transformation and tumorigenesis . In particular, cullin1, the most characterized member of the cullin family, was proven to be closely associated with gastric carcinogenesis, and its overexpression predicts poor prognosis of patients with gastric carcinoma [6, 7]. The expression profiles of cancer-related genes in part reflect their biological features in the pathogenesis of cancer. Being a novel member of the cullin family, CAC1 expression patterns have been extensively investigated in a previous study . Using cDNA library analysis, CAC1 expression was found in normal stomach, small intestine, colon, liver, lung, kidney, muscle, heart, mammary gland, uterus, brain, spleen, lymph node, with high levels in the colon and mammary gland . Western blot tests additionally detected CAC1 protein in a host of normal and cancer cell lines . 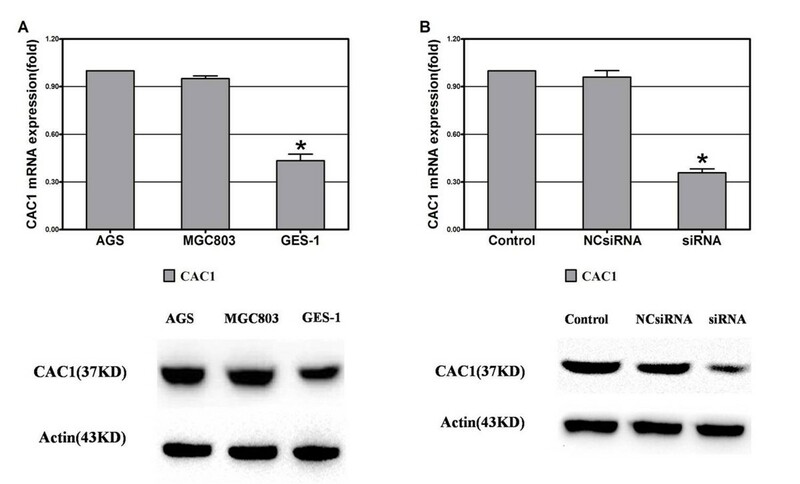 With regard to our study, the AGS and MGC803 gastric cancer cell lines had higher CAC1 expression than the GES-1 gastric mucosal cell line, which indicate that CAC1 may play an active role in gastric carcinogenesis. Gene silencing by RNA interference is a powerful method for analyzing gene function . Here, we successfully transfected NCsiRNA and three concentrations of CAC1-siRNA into AGS cells. MTT analyses showed that the proliferation potential of AGS cells was potently inhibited by 60nM and 90nM CAC1-siRNA to the same degree, but failed to be influenced by 30nM CAC1-siRNA or NC-siRNA. It was apparent that CAC1 could positively affect cell proliferation in gastric cancer, which was in accord with previous studies on the HeLa cell line . In MTT examinations, HeLa cells expressing Flag-CAC1 underwent higher proliferation ability than the mock transfected control cells, and cells treated with CAC1-siRNA showed significantly inhibited growth rate . What’s more, real-time RT-PCR and western blot analyses confirmed that the expression of CAC1 was efficaciously blocked by 60nM CAC1-siRNA. Taken together, 60nM was determined to be the most suitable experimental dosage for RNAi in subsequent examinations. As a general rule, normal cell proliferation depends on orderly and efficient cell cycle process that ensures the duplication and transmission of genetic information from one cell generation to the next. In other words, deregulation of cell proliferation always lies in an abnormal cell cycle. Under CAC1-silencing conditions, flow cytometry in our study revealed elevated proportion of cells in the G1/G0 phase and a reduced rate of cells in the S phase. In essence, CAC1 knockdown induced G1 cell cycle arrest in the AGS cells, which was consistent with the results from the HeLa cell line . CAC1 was also capable of binding to CDK2 and stimulating its kinase activity at the G1/S phase transition without greatly changing the expressions of cyclinA, cyclinE, cyclinD1, CDK2, RB, PTEN, and so on . It is supposed that CAC1 depression attenuates the activity of CDK2 and interrupts the G1-S transition. Apoptosis is one of the basic biological phenomena characterized by a series of transformations in cell morphology . Furthermore, apoptosis in concert with cell proliferation forms a crucial balancing mechanism that manages a large number of physiological procedures such as tissue homeostasis and normal development . Under pathological circumstances, aberrant apoptosis usually contributes much to the initiation and progression of cancer [10–12] and even influence the sensitivity of cancer cells to therapeutic interventions . The unequivocal activity of CAC1 in cell cycle regulation raised the possibility that it is, more or less, involved in the process of apoptosis. In the current study, the proportion of early/late apoptotic cells increased with cisplatin treatment, but increased even more so when CAC1 expression was concurrently inhibited by RNAi. That is to say, apoptotic indices of the cisplatin plus CAC1-siRNA group obtained a significant increase in comparison with those of the former three groups with intact CAC1. Cumulative data imply that CAC1 may weaken the anti-cancer effect of cisplatin by counteracting cisplatin-induced apoptosis. Regulation of apoptosis, however, relies on a network of anti- and proapoptotic molecules such as BCL2 family . BCL2 (B cell CLL/lymphoma 2) is a proto-oncogene located in the chromosomal region 18q21.3, which codes for an antiapoptotic 26-kDa protein containing four BH domains (BH1 ~ BH4)) . It can hinder the release of cytochrome c from the mitochondria, thus abrogating the activation of caspases and finally inhibiting apoptosis . According to early studies, the overexpression of BCL2 drives cells toward malignant transformation  and predicts the prognosis in many malignancies [18–22]. Particularly in gastric cancer, frequent expression of the BCL2 gene always occurred in malignant tissues [23–25]. High expression levels of the BCL2 gene, though correlated with less aggression of stomach cancer , had a lot to do with drug resistance of the cancer cells . BAX (BCL2 associated X protein) gene is located in the human chromosomal region 19q13.3-q13.4 . Its 21-kDa encoding protein, in particular, serves as a proapoptotic member of the BCL2 family. BAX protein consists of three BH domains (BH1, BH2, and BH3) and shares a lot of homology with the BCL2 protein. Indeed, BAX protein acts as a suppressor of BCL2 to accelerate apoptotic cell death, by forming BAX/BCL2 complexes or by competing with other BCL2 targets . Overexpression of the BAX gene had a negative effect on cell growth in human gastric cancer, owing to the induction of apoptosis and to the enhancement of cell chemosensitivity . On the contrary, suppression of BAX gene expression induced tumorigenesis in gastric epithelia . Cisplatin is a kind of chemotherapeutic agent widely used in solid malignancies including gastric cancer. It is generally accepted that its primary cytotoxic effect is DNA damage and subsequent induction of apoptosis , so variances of apoptosis-associated genes in cisplatin treated cells penetratingly mirror the mechanisms underlying cisplatin-induced apoptosis. As for our study, CAC1 expression was upregulated by cisplatin treatment, but was markedly downregulated by siRNA treatment despite previous cisplatin. Furthermore, underlying the increase of cisplatin-induced apoptosis that follows CAC1 silencing are concomitant gene expression alterations including the upregulation of P53 and BAX as well as the downregulation of BCL2. 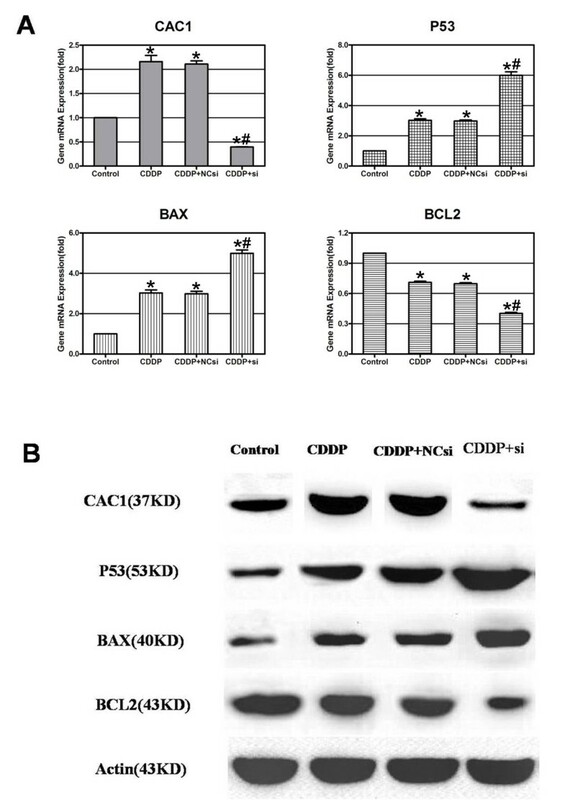 These effects suggest that CAC1 strengthens cisplatin-induced apoptosis by modulating the expression of BCL2, BAX and P53. As mentioned previously, BCL2 is seemingly situated at the convergence of a couple of apoptotic pathways, and the ratio of BCL2 to BAX protein appears to be the final determinant of whether a cell enters the execution phase . In fact, it is the BCL2/BAX ratio that governs the sensitivity of cells to apoptotic stimuli [32, 33]. In the process of cisplatin-induced apoptosis, CAC1 might protect AGS cells from apoptosis by altering BCL2/BAX ratio, for CAC1 silencing brought out a pronounced increase of BAX and a decrease of BCL2, which was conducive to the occurrence of cell apoptosis. Interestingly, the P53 gene in the AGS cells was upregulated with the cisplatin treatment, especially with synchronous suppression of CAC1. It is well known that P53 plays an important role in the management of cell cycle and apoptosis. DNA damage resulting from cisplatin may stimulate expression of the P53 protein that results in both expression of downstream P21 protein and G1 cell cycle arrest . If confronted with irreparable DNA damage, the P53 protein triggers programmed cell death . During cell apoptosis, P53 activates BAX via transcriptional  or transcription-independent  mechanisms, and represses transcription of BCL2. Furthermore, P53 can nontranscriptionally induce apoptosis . Therefore, CAC1 inhibition in the AGS cells can bring about excessive P53 accumulation, BAX accumulation, and BCL2 reduction, which ultimately potentiated apoptosis. The mechanism by which CAC1 functions is not fully clarified. CAC1 was able to reinforce the activity of CDK2, and CAC1 silencing probably impaired the CDK2 activity. An early study argued that CDK2 inhibition could lead to ATM- and ATR-dependent P53 phosphorylation at serine 15, and thereby cause a significant increase of P53 and P21 protein . With the potential to activate CDK2, CAC1 is inclined to interfere with the P53 P21 pathway, and thus help AGS cells to resist G1 arrest and apoptosis. On the other hand, CAC1 can serve as a corepressor of RARα to negatively regulate retinoid acid-induced cellular differentiation and CoRNR box is confirmed to be a major functional region of CAC1. So it seems that CoRNR box has the potential to regulate cell proliferation and apoptosis, which deserves to be further investigated in other studies. In summary, CAC1 exerts multiple biological effects in the AGS gastric carcinoma cell line. Through promoting proliferation and by countering cisplatin-induced apoptosis, CAC1 has been deeply implicated in the pathogenesis and development of gastric cancer. More explorations on specific details of the molecular mechanisms are warranted in the future. QZ, L-YZ, and K-JN designed the research. QZ, L-YZ, YK, YY, and Z-JL performed the research. QZ and L-YZ analyzed the data. QZ wrote the paper. All authors read and approved the final manuscript.